Shop Demo Model #412 (has a few very minor superficial scratches). 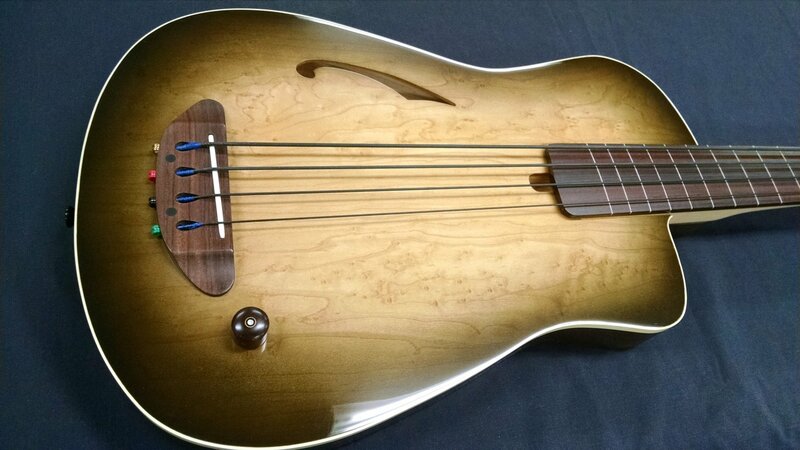 The Bassic Bass has some very unique sounds & features contributed to its Semi-Acoustic Construction, exclusive Unique Patent Pending Sound Chambers, 2 Internal Acoustic Pickups and Solid Premium Tonewoods, which gives it that full warm woody sound, along with its beautiful warm natural look & feel. Another benefit is its size & weight, making it very easily playable for newbies to pros. Very articulate & clean, plenty of punch, very focused with a big tight low-end & deep fat lows. -Overall Length: 2x13x44" - Weight Apx. 8lbs. This Bass sounds very similar to the one in the video below.